Home « Read the Refreshed booking rules for the Dome?? Dome – Peak Times rules apply at Windsor! The Dome is up!! Yay!! You need to refresh yourself with the booking rules!! Members may book only one Dome court during any 7 day period and can only play in twice during that period, during peak hours. Only exceptions are if filling in at last minute or if the booking is made on spec i.e. on day of play. Failure to cancel a booked Dome court will mean loss of court booking privileges for a period of 2 weeks. 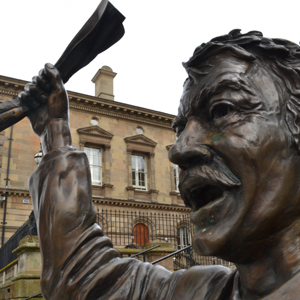 Oh, the man in the pic is ‘The Speaker’ at Custom House Square in Belfast.